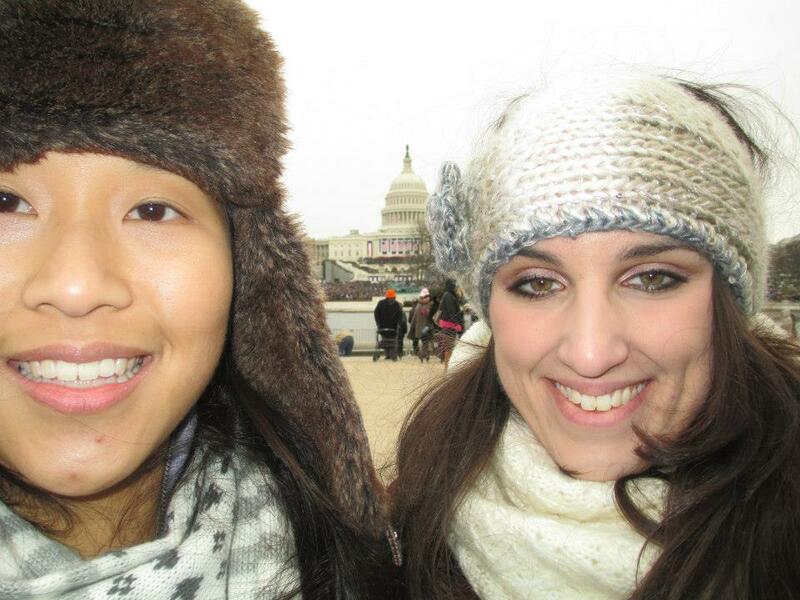 Bedecked in official inaugural buttons, bundled up in layers upon layers of our warmest clothes, and sleep-deprived, Tiffany and I ventured into the brisk Monday Morning that was Inauguration Day. It was 4:30 am and we were armed with footwarmers, bagels with cream cheese, snack bars, bottles of water, a blanket, and wristlets. We boarded the Metro and as soon as we exited the station around 5 am, we found ourselves in the line of the Gold and Yellow ticket holders. We knew ahead of time that our tickets guaranteed us a spot on a vast lawn that was right behind the reflecting pool in front of the capitol. Tiff and I stood in line with other excited people for approximately an hour and a half. I will be honest, I was cranky, I wanted coffee, and I was cold. Even though I had thick tights under my thickest jeans, wool knee socks, footwarmers, and boots, my feet and legs were still freezing. Tiff and I wrapped the blanket around our waists as we fumbled with all of our other belongings that a security notice had told us could not be in a bag over 6″x8″x4″, so we just stuffed our pockets. The line would advance at random points without any clear indication as to why. Finally, we were told the gates had been opened. We clutched our tickets and quickly progressed, knowing that the sooner we got to security, the sooner we would be at our spots. We hustled to one entry point where we emptied all our pockets and opened our wristlets and walked through a metal detector. Cleared, we continued our fast pace. We came across one worker who was about to direct us towards the left, but then said nine key words: “Wait, are those yellow? That makes a big difference,” and then directed us towards the right. It turns out that we would have been MUCH farther from the action if we had gone to the gold section. Tiff and I nearly jogged and realized that we would be in the FIRST ROW of our section!!! How the heck did that happen?? (Definitely the Founding Fathers – they clearly had our best interest in mind all weekend). But it was only 7:10 at this point, still four and half hours away from the start of the ceremony. Little did we know, but we would be on our feet for several hours straight, as there were no chairs and we didn’t feel like sitting on the ground was the best option. We settled in and chatted with the people around us. One woman expressed her disbelief over the fact that this kind of cold was something we were accustomed to, as she was from the U.S. Virgin Islands and had been at the President Obama’s First Inauguration. 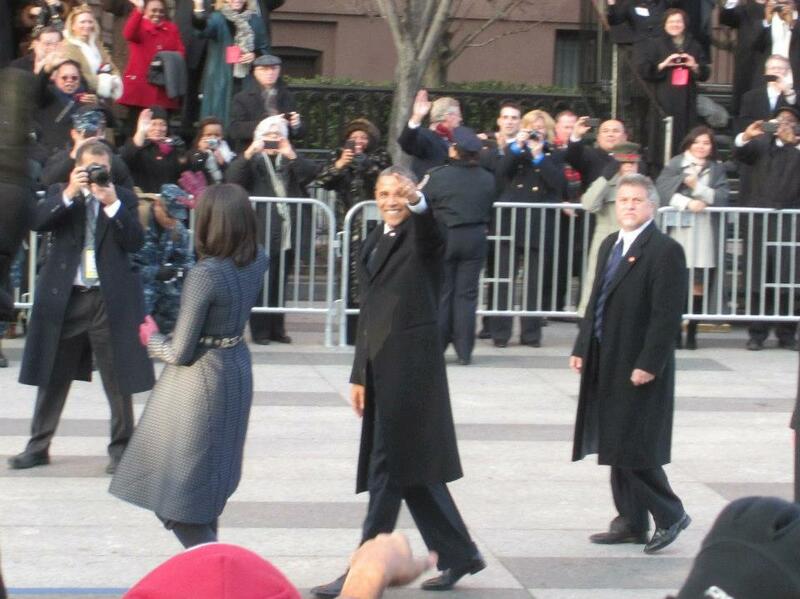 Two middle-aged women behind us seemed to know everything there was to know about politics in DC and shared their excitement with us; they, too, had been to President Obama’s first Inauguration. Finally, the musical prelude commenced at 9:30, which made the time go by much more quickly. We caught glimpses of the motorcade progressing up the road to the left of the Capitol, freaking out that the president and every one of our representatives would soon be present. The Oaths of Office were given, and an assertive address left me with hope that we will see the change the country so desperately needs in this next term. 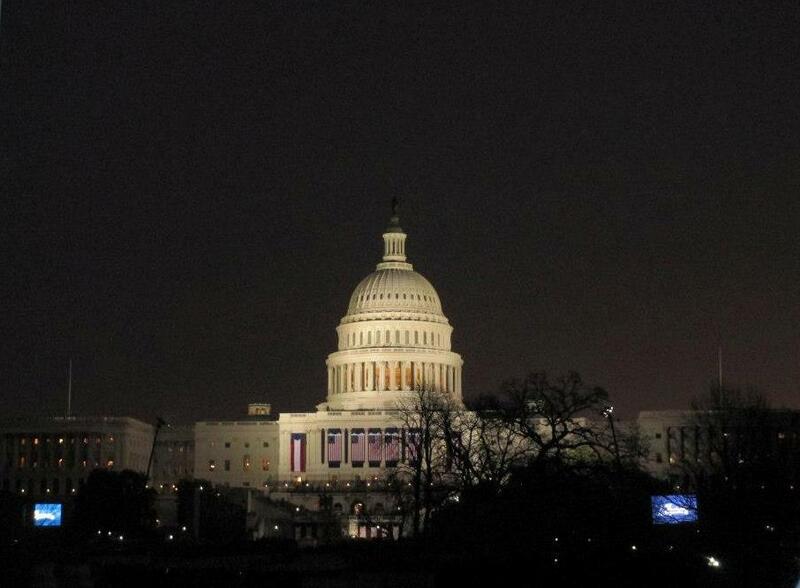 I found myself looking at either the Capitol or just at a point in front of me because looking at the jumbo-tron reminded me too much of when I watched the 2009 Inauguration on a projector screen in my college’s campus hub. I wanted to feel like I was there and to fully be present in the fact that I was at an event that has only happened 57 times in our nation’s entire history. It was remarkable. One of the most moving moments throughout the ceremony was being with so many diverse Americans. When Obama mentioned women, a bunch of us cheered. When he referenced Latinos, a group behind us cheered. This pattern continued and there was something so moving to me in it. We clearly all had very different interests in what the next 4 years would do for us, but we were united on a lawn, cheering for the president that was elected by the will of a free people. It was nothing short of beautiful to stand there as a testament of what democracy can accomplish. At the end of the ceremony, Tiff and I had to trek about 15 blocks to where our tickets to the parade were. We hustled over there, eager to just sit down and relax. Sadly, once we got there, Tiff and I got separated for the parade when she kindly went to get us food. Before our separation, though, we realized that our ticket seats placed us at the very end of the parade route and we expressed our hope that we would still be able to see the President and Vice President. I was overcome with excitement when I and those around me looked down just past our seating area and realized that the President had exited his car. Between the screaming and the cheering, I snapped several awesome photos. 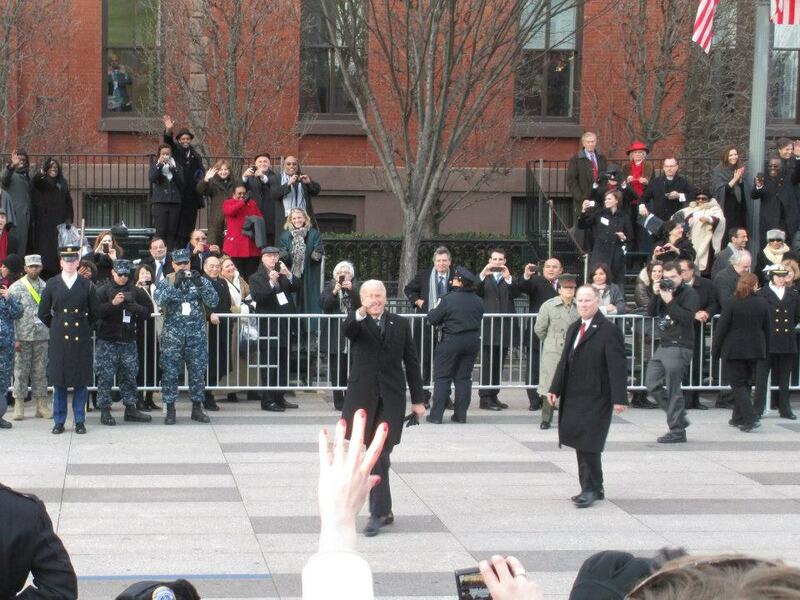 The President couldn’t have been more that 50 feet away from me, and seeing him and his wife as well as the Bidens in person felt like a dream. Did this really just happen? Was I really present for all of this, an event that I said I would attend 4 years ago when I watched the 56th Inauguration on a screen in Massachusetts? It was real, and it was something I will never forget. I will never forget the feeling I had among so many of my fellow Americans, from all different walks of life, cheering for hope for the future. I will never forget spending a long weekend with a friend who is so far away now, reminiscing on moments in the past and sharing dreams of an ambitious future. I will never forget the conversation I had on the phone with my grandfather when I got home about the whole experience, when he told me in response to my description of the FDR Memorial about the time he saw Eleanor Roosevelt while he was on rest and recovery in the Pacific during World War II. I will never forget the excitement I had to go back to my students and tell them all about my experience at a moment in history. And I will never forget how proud I was to be an American that weekend while I was present for an event that shows the power of democracy, in a place that serves as a reminder that the protection of natural rights like those of equality and free speech enable people like Frederick Douglass and Elizabeth Cady Stanton and Martin Luther King, Jr. to fight for the rights that all people deserve. Last Monday night, June 25. I’m driving home from the first meeting of my second grad class, a colloquium on American Slavery. It’s only Monday and I’m already exhausted, thinking of the lesson plan I have to send in in less than 24 hours in order to be done with my first grad class that finished the week before. As I descend the ramp to get on the Pike, feeling home free and dreaming of my bed, I see the cars in front of me stop, with what looks to be a police officer dressed in a neon vest waving his arms over his head to get us to all stop. I’m only about 10 cars back from the end of the ramp, thinking, “Really? I was SO close…if only I had left a minute or two earlier I might be on my way home, nothing but the open road in front of me for my 40 minute commute!” Well good thing I wasn’t, because I was about to witness something that would make me feel like the adult equivalent to a Justin Bieber fan. I notice the car in front of me turn it’s engine off and I think, “What does he know that I don’t?” My mind races through the possible horror movie scenarios…maybe there is a crazed gunman on the highway, or structural issues with the overpass I was just about to drive under. A well-dressed Indian man steps out of the white Honda in front of me and looks back and forth. I glance in my rear-view mirror and see a younger professional woman at the side of her car, looking perplexed. I step out of my little black coupe and ask the man in front of me if he can see anything. He shakes his head. At this point, there is a clear line of cars behind us. Some horns honk from far back – clearly, they have no idea we have been stopped by the police. I get back in my car and wonder if it’s worth shutting the engine off – we clearly aren’t going anywhere soon. Without internet on my phone, or the patience to scour radio stations for traffic reports, I call my mom at home and ask her to look up reports online. Then, I see a stream of blue flashing lights. “Must be some really bad accident,” I somewhat mechanically think as I explain where exactly I am to my mother. And then it registers that there have been at least 5 motorcycle cops who have zoomed by. Then more, and more. Several people have exited their cars at this point to look over the edge of our on-ramp. I follow suit. I hear the word “president” to my right and look to see a balding man and his son, who looks about 7, walk away from their big, black pick-up truck. Both wear Red Sox shirts – the embodiment of New England men, yet a contrast to the Indian man who is also at the edge of the ramp with his wife. I reach the edge and look down over the short wall, still on the phone with my mother who has just suggested that maybe someone important is in the area upon hearing about the multitude of motorcycle cops. I look directly below me and see an SUV, then a limo. The limo seems familiar. Two flags flap in the wind of the highway – an American flag and the flag bearing the seal of the President of the United States. That’s when I recall a tweet I saw earlier in the day about Preesident Obama being in Massachusetts. DID THE PRESIDENT JUST DRIVE BY ME?!?!?!?!?! Now I have been relatively indifferent on President Obama’s term as president. There are stories I hear that make me approve of him, and then the next day I hear a story that makes me sigh with disappointment. But in that moment of feeling starstruck at the LIMO of the President, I realized something: as an American, I will always have respect for the sovereign head of state. Obama was elected by the will of a free people, and for that, I must respect him. We all should. Millions in the world dream of such a right to elect anyone in their nation, nevermind the head of it. And so many of us throw away this right through general voter apathy and a lack of civic spiritedness. But why? As I got back in my car once the complete motorcade passed by, I was struck by something else. What a beautiful scene of America I had just taken part in. The middle class father with his young son, the boy undoubtedly making a memory he’ll never forget as he and his father watched the President drive by. The Indian man and his wife, his accent revealing that he is not originally from this country, but his school-boy excitement mirroring my own nonetheless. The woman behind me, most likely a young professional, whose silent curiosity reminded me of my own. And me, a recent college grad and newly licensed teacher, and thus heavily invested in any and all laws pertaining to education. In one instant, despite never having met each other and clearly all very different from each other, we were united on an on-ramp in curiosity and awe as the President of our nation drove by. 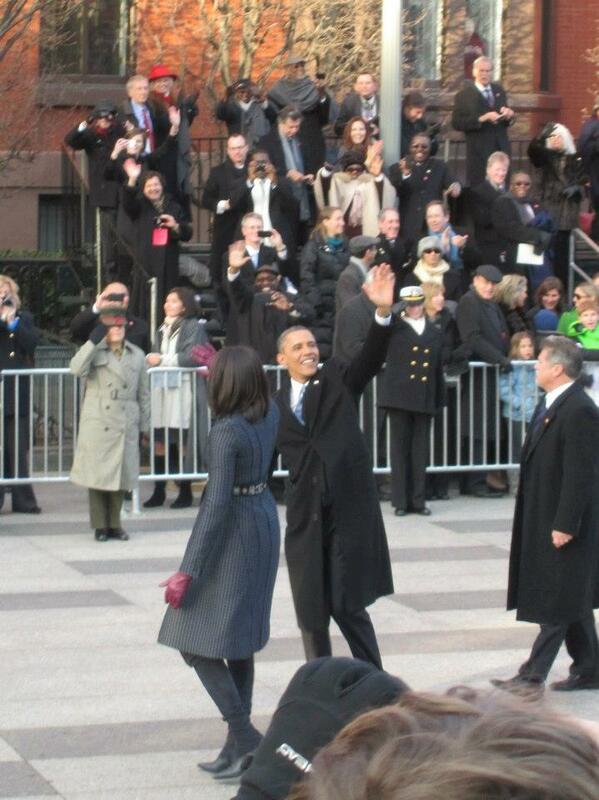 And I was leaving a HISTORY class on AMERICAN SLAVERY as the nation’s first black president drove by me. How is THAT for a beautiful irony?